The age-old adage “The cream always rises to the top” was never more true than at the first three events on the 2018 ALPG Tour, with the big stars stepping up and claiming the headlines and the trophies. Our 2018 Tour and ALPG ClubCar Series kicked off on 28th January with a new pro-am on our schedule, the ALPG Ballarat Icons Pro-am which was played at Ballarat Golf Club in Victoria’s Goldfields. Led by General Manager Michael Phillips and ALPG Professional Angela Tatt, everyone at the club was incredibly supportive and despite the oppressive heat and windy conditions a great day was had by all. A fantastic field was assembled with 75 professionals from 17 different countries competing, with Chinese Olympian XiYu Lin emerging victorious, defeating former European Masters champion Lydia Hall from Wales on the second playoff hole after both players had carded 3-under-par rounds of 69. From Ballarat the ALPG Tour headed just 90 minutes south-east to 13th Beach Resort in Barwon Heads for the 2018 Oates Victorian Open. This tournament continues to go from strength to strength each year due to a number of factors; a superb venue, a great title sponsor in Oates, incredible government support from both the Victorian State Government and the City of Geelong, and an amazing group of highly motivated and committed Golf Victoria staff. The prizemoney continues to grow for both the men’s and the women’s events; three years ago the combined prizemoney was $300,000, this year it was $1.3million. Once again huge crowds flocked to Barwon Heads to watch a high-class field of women and witness Australia’s number 1 player Minjee Lee at her very best, shooting a final round 6 under par 67 to take out the women’s event by 5 shots from ALPG rookie Karis Davidson. Lee had won the title as an amateur back in 2014 and was delighted to claim victory as a professional and start her year with a win, the 21-year-old determined to crack the world’s top 10 in 2018. A huge thanks must go to Simon Brookhouse and his staff at Golf Victoria who once again did an outstanding job running an event which continues to flourish year upon year. From the Bellarine Peninsula, the ALPG Tour headed to our National Capital, Canberra for the ActewAGL Canberra Classic at Royal Canberra Golf Club. Another top-class field assembled including ALPG stars Minjee Lee, Katherine Kirk, Sarah Jane Smith, Rebecca Artis, Sarah Kemp, and Whitney Hillier; former World Number ones and Australian Open champions Jiyai Shin and legend Dame Laura Davies along with a host of big names including Cheyenne Woods, Catriona Matthew, Mel Reid and Georgia Hall. ALPG was responsible for the promotion and staging of the tournament; quite an undertaking given we have just three full-time employees, and we could not have done it without the fantastic support we received from the Board, Staff and Members of Royal Canberra Golf Club, and that of our title sponsor ActewAGL. I also would like to thank our chief referee Luke Bates from Golf Queensland, along with Les Wallace from Golf NSW, Peter Castrisos from Golf Australia, Michelle Hui from Golf Victoria and former Golf NSW Chair Chris Allen who all put their hands up to referee for the tournament. This is a great example of the increased level of collaboration between the peak golfing bodies in Australia and certainly bodes well for the future of golf in Australia. Also a big shout out to our other event partners and sponsors Audi Centre Canberra, The Doma Hotel Group, Coca-Cola Amatil, Drummond Golf, Bing Lee, Qantas, Compass Global Markets, Cutter and Buck, Revo, Volvik, Wardrobe World Canberra, The Jack Newton Junior Golf Foundation, the Ladies European Tour and the ACT Government, who provided us with funding which enabled us to live stream the final round of the tournament. The crowds turned out in their droves, and the big stars did not disappoint, putting on a fantastic show for the three days of the tournament, with Korean superstar Jiyai Shin finally emerging victorious after a magnificent final-round 64. 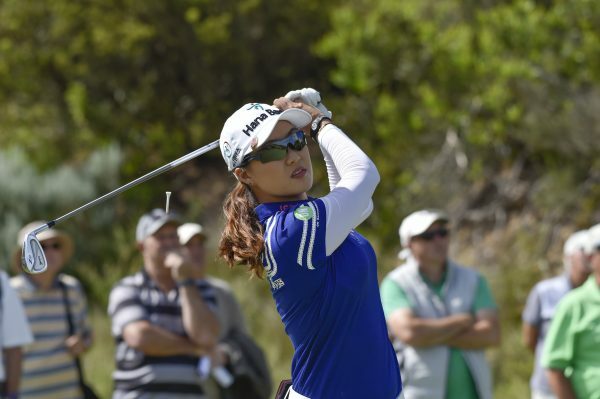 Shin was a popular winner having taken out the ISPS Handa Women’s Australian Open in Canberra’s centenary year in 2013 also at Royal Canberra GC. Be sure to read next month’s Inside Golf for all the stories!